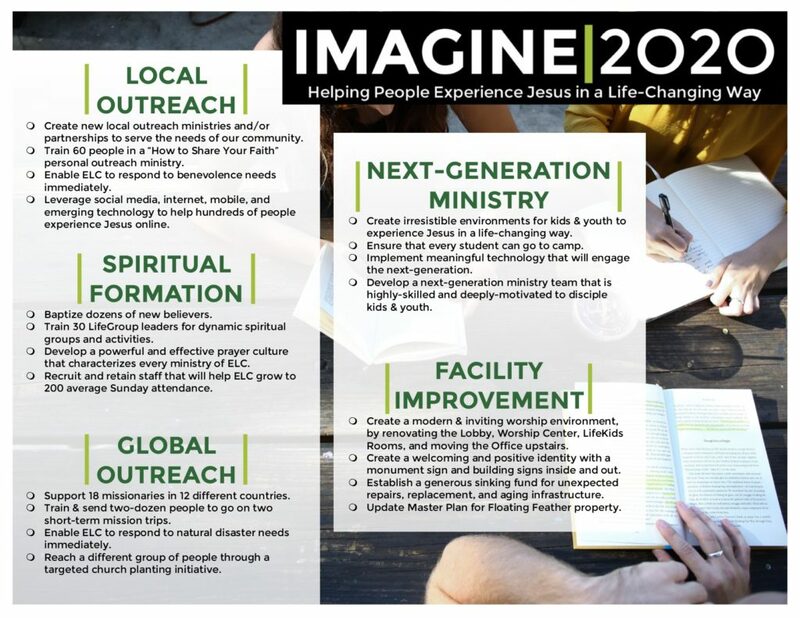 Between January 2018 and December 2020 with the Lord’s help, we imagine that these things can be accomplished! All with the goal of seeing the grace of God transform us as individuals, families, church, and community. 2018 21-Days for Prayer | 40 participants started the year with prayer and fasting. 2018 Summer Camp | 24 students went to camp. Over $2000 in scholarships awarded. 2018 Youth Room | Youth Meeting Room and Game Room renovation (Paint, decor, lighting). 2018 Sound System | New sound board, digital snake, and other accessories for Worship Center. 2018 Text-to-Church | Implemented Text-to-Church software. Try it! Text the word EVENTS to (208) 352-6002. 2018 Kids Ministry Training | Trained all LifeTots and LifeKids volunteers on new policy and procedure manual. 2018 ELC Youth Director | Hired part-time youth director. 2018 ELC Kids Director | Increased salary for kids director. 2018 Installed new interior building signs. 2018 Launched Instagram | @EagleLifeChurch, and @elc.youth. 2018 RightNow Media | FREE Video Resources for every family. 2019 Replace Worship Center speakers, microphones, and musicians monitors. 2019 Update Online giving and expand text-to-church usage. 2019 Purchase and install new Worship Center VIDEO technology. 2019 Increase monthly missions giving by $400/month. 2019 Baptize 12 new followers of Jesus. 2019 Fully fund kids and youth Summer Camp discipleship. 2019 Fully fund youth Fine Arts ministry. If you would like to help accomplish these things, learn how to get involved. If you would like to help fund the vision, you can give here. If you have questions contact us or come to a Newcomers Lunch.